"Like Rocky 5 never happened! Apparently Rock's brain damage brought out the philosopher in him." Personally, I don't think 2007 could be kicked off in a better fashion, do you? It would be a great injustice NOT to review the latest of the Rocky canon. I hope to get reviews penned for the filler of what better be the 2 Rocky bookends. If we see the Italian Stallion lacing them up in his 70's, I plan on just ignoring it. And truthfully the biggest roadblock for me has been the prospect of viewing all those other Rocky movies again. While I loved them as a child, they haven't stood up to repeated viewings. I think Stallone (or the producers) were geniuses in the timing of this set of movies, meting out just the right amount of Sly every 3 years or so. It kept the character fresh, while the missteps of the previous movie could just fade into oblivion. That being said, the greatest wrong you could commit in regards to these movies would be to, say, run a non-stop marathon of them back-to-back... which is exactly what the cable networks have been doing ever since the Christmas '06 release of this movie. It's almost too much to take. 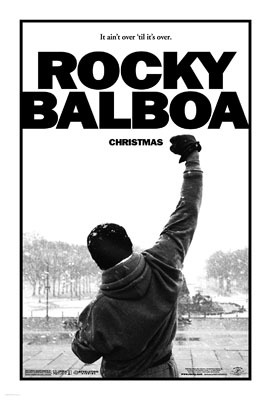 The acting talents of Mr. T, Dolph Lundgren, and Tommy Morrison not withstanding, it's the dialogue penned by Mr. Sylvester Stallone that's most spit-take, forehead-slapping, milk-out-the-nose-giggle inducing in Rocky's 2 thru 5. So, it was with great trepidation that I settled into my seat for the 6th installment. The destination is absolutely spoiler proof, so I'll lay it out simply. A computer-simulated boxing match is played out on ESPN between the current undefeated (but publicly reviled) champion, Mason "The Line" Dixon (Tarver) and the people's champion from yesteryear, Rocky Balboa. This exhibition captures the imagination of the public and gets the perspective gears of our main characters grinding. The champ wants respect, the promoters (played by AJ Benza and Lou Dibella) smell cash, but what does Rocky think? Up to this point Rocky is presented as a man with something picking away at him from the back of his mind. His beloved Adrian (Talia Shire showed in loving and, more importantly, tasteful flashbacks) has passed away from cancer, and he visits her grave daily. His son, Robert (Milo Ventimiglia) seems to be purposely avoiding him, visibly embarrassed by the adulation that his father still garners from the Philly locals. Rock runs his restaurant (named 'Adrian's', which was a nice touch), surrounded by the trophies and reminders of his past. He gladly stops to share an old war story with a patron, or pose for a "put-yer-dukes-up" photo op, but the absurdity and falseness of it all seems to be beginning to chafe. The subtlety that Stallone uses to convey a man beginning to stew in his own juices is a revelation. It's not just aging (not to mention some of the most over-tweezed eyebrows I've ever seen) that make it hard to remember the actor from 30 years ago. You also have to wade through all the catch-phrases and flexing that have filled that time ("Copland" being one of the rare exceptions). But once you stop saying "You're the disease, and I'm the cure" to yourself in his distinctive grunt, you remember the promise that Stallone showed WAY back in 1976. Also of note are the other 3 principle characters. Burt Young's Paulie hasn't become any more refined, but Young plays his "sick of himself" pathos with aplomb. Milo Ventimiglia manages to portray a child who feels overshadowed by his famous father without sounding whiny, which is tougher than you think. And Geraldine Hughes plays someone minor from Rocky's past with grace. She's the perfect female mirror to Rocky's machismo; just a tough girl from Philly who's been there and done that and seems a little skeptical of anyone who offers a helping hand. Stallone was able to write dialogue for these 3 parts that was both poignant and real, something sorely lacking in the previous sequels. But, it wasn't all sunshine and roses. For whatever reason, Rocky is infinitely more adept at expressing himself in this one, as if aging and multiple punches to the melon have stoked his inner Socrates. Stallone has a few monologues that seem a little too well worded and crystal clear to be coming out of Balboa's normally slurring and bungling pie hole. And with the focus so squarely on Rocky's tribulations, it's his opponent, Mason "The Line" Dixon who gets shortchanged. While it would be easy to blame Antonio Tarver for the performance, I think it falls squarely on the script's non-development of the character. That's the most eloquent way I can put it. He's not underdeveloped, because he gets ample screen time. He's just not made to be very sympathetic or believable. Perhaps a more seasoned actor would have demanded or coaxed something more out of the part, but I'm willing to give Tarver the benefit of the doubt. And finally we come to the conspicuous absence of Talia Shire as Adrian. She was the emotional center of all the other movies. And despite her lack of physical presence, Stallone treats the memory of her character with picture perfect dignity and charm. He once again showed off his acting chops in the scenes where he reminisces about Adrian. He manages to pull up just short of melodrama in regards to her passing, and I'm more than thankful for that. Too much weeping "Italian Stallion" gets me all antsy in the pantsy. Putting that aside, the key phrase here was "less is more". The absence of horrific facial trauma and the audible slaps that were SO popularized in the previous movies was greatly appreciated. And call me a sap, but I could have done with an even longer training sequence. I know it's been done to death, but I'll never tire of those string-fueled Sly montages! And I have to give credit for the job they did with the crowd (filmed before the Bernard Hopkins/Jermaine Taylor middleweight title fight rematch in December of 2005) and the HBO and ESPN personality cameos. It made for a very realistic and exciting atmosphere. It's not often that a movie totally catches me off guard. While my expectations may have been low, I have to give credit where credit is due. First and foremost, I have the ultimate respect for Bill Conti's original music. It's done more for these movies than anything they may have caught on film. It never fails to put a lump in my throat and get my pulse pounding. But equally important is Sly's contribution. Sylvester Stallone penned a fantastic script and played his most famous part with poise and humor. Rocky Balboa might not be the sharpest knife in the drawer, but that doesn't make him any less human or make we the audience care for him any less. Just the opposite. We love him all the more for it. And he (and Stallone) left the ring with dignity.